Info "The secret to delicious pizza is the crust! Twirl the dough with your hands in the air. Higher!" Dough Boy is a Microgame in WarioWare: Smooth Moves. It appears in the Mona stage. The title is a reference to the Nintendo Entertainment System game, Dough Boy. The player is a chef and must spin a pizza so toppings will be put on. 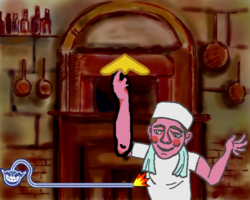 1st level difficulty: The player must spin the pizza a little. Three pepperoni toppings will be the result. 2nd level difficulty: The player must spin the pizza longer. Pepperoni and spinach toppings will be the result. 3rd level difficulty: The player must spin the pizza a long time. Pepperoni, spinach, and onions will be the result. This page was last edited on February 19, 2018, at 16:53.